The corner shelf with a step style helps you to save space and decorate the corner of your room or garden. The rack is safe and stable， Its reasonable design conforms to the principles of human engineering. 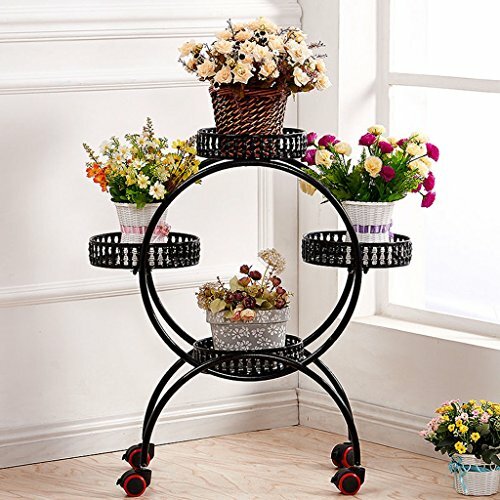 1: only sell flower racks, other items belong to the props, the flower rack is a single. 2: data are manual measurement, there may be 1-3CM error, the icon data for reference only, please prevail in kind, please understand. 3: due to shooting light, display display and other reasons, there are slight color difference are normal. 4: Iron furniture do not long idle, dust Please use pure cotton fabric rags, gently wipe. European retro design, elegant and generous shape, stylish and beautiful, is a good home life with, beautify your home. The overall framework of high quality iron pipe to create, environmental health, bearing strong, anti-corrosion rust, safe and secure. Comes with plastic pulley, easy to move, fast. If you have any questions about this product by Flower Pot Stand, contact us by completing and submitting the form below. If you are looking for a specif part number, please include it with your message.